The commander of rebel group FARC‘s Southern Bloc, generally accused of being one the rebels’ main drug trafficking units, has joined ongoing peace talks with the government in Cuba, leaving the majority of FARC units without its original commanders. “Joaquin Gomez,” whose real name is Milton de Jesus Toncel, commands the FARC’s Southern Bloc that is active in the southern Putumayo and Caqueta states. The rebel leader has frequently been dubbed the FARC’s main drug trafficker by authorities. With the arrival of Gomez, five of seven members of the FARC’s secretariat, its highest military body, are now directly involved with the peace talks. The ones left in Colombia are commander-in-chief “Timochenko,” the commander of the Eastern Bloc, “El Medico,” and the unknown commander of the smaller Central Joint Command Bloc. Gomez’ second in command, “Fabian Ramirez” had already joined the talks. 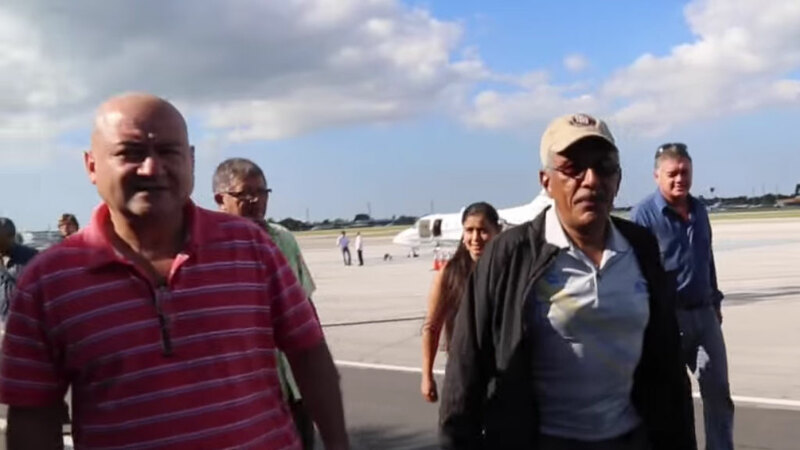 Other members of the secretariat in Cuba are delegation leader “Ivan Marquez,” Western Joint Command chief Pablo Catatumbo, Eastern Block commander Carlos Antonio Lozada, Ivan Rios Bloc commander “Isaias Trujillo” and “Pastor Alape,” the right-hand man of Timochenko. The FARC announced the arrival of Gomez in a video on Sunday and said the Southern Bloc commander will take part in the rebel subcommittee that is negotiating the logistical end of the armed conflict with the military. So who’s watching the FARC shop? Now that Gomez is in Cuba, it has become unclear who is leading the FARC’s seven main armies. The only known commanders to have stayed in Colombia are Timochenko, El Medico and Bertulfio. Authorities believe Timochenko is operating from the northwestern Catatumbo region and neighboring Venezuela. The Eastern Bloc is still commanded by El Medico. As the commanders of the Central Joint Command, or the “Commander Alfonso Cano Bloc,” are unknown, it is uncertain whether this unit is represented in Cuba. The replacement commander of the Ivan Rios Bloc, a highly active rebel army in northwestern Colombia, is also unknown. Following the departure of Isaias Trujillo, the group continued attacks until a unilateral and indefinite ceasefire went into effect on December 20. Gomez’ arrival and integration into the subcommittee to negotiate the end of conflict comes a week after this ceasefire came to force. A cessation of controversial guerrilla activities like the recruitment of fighters and drug trafficking were not suspended. While the main committee is still negotiating victims, Gomez’ subcommittee is negotiating directly with the military to secure an effective and bilateral cessation of violence between the state and the leftist rebels who have been fighting that state since 1964.
Who is Gomez and what does the Southern Bloc do? As chief of the Southern Bloc, Gomez is responsible for one of the group’s most financially important units, as the bloc extends its influence over some of the most important coca growing regions in Colombia. The Southern Bloc also has carried out frequent attacks on oil infrastructure along the Ecuadorean border. Gomez is believed to command some 1,800 guerrilla fighters divided into ten different fronts and three mobile columns in Putumayo and Caqueta. The rebel commander is considered a political figurehead and a respected military leader within the group. The FARC and the government have been engaged in talks since November 2012. Since then, agreements were reached on rural reform, the FARC’s eventual political participation, and the rebels’ abandoning of drug trafficking, once of the main sources of income that has helped the FARC obtain the funds for arms. If successful, the negotiations will end 50 years of violence between guerrillas and state. The conflict has known a series of armed actors and had left more than 900,000 Colombians dead and some 6 million displaced.